The long and warm summer days will soon be a memory, so it is time to savor them. This week's stress relief photo was taken at a farmer's market in Chicago, Illinois. Please enjoy and feel free to share the photo and inspirational quote with loved ones. Thank you caregivers and certified nursing aides for your hard work and caring for our seniors. Senior care training assists caregivers to better manage a senior's care needs and manage caregiver stress. We hope you have a great week. "Let yourself be silently drawn by the strange pull of what you really love. It will not lead you astray." The power and beauty of nature can be awe-inspiring. This week's stress relief photo was taken at the Gullfoss waterfall in Iceland. Caregiverlist invites you to enjoy the photo and share it with loved ones. At Caregiverlist we know the realities of caregiver stress. Thank you caregivers and certified nursing aides for your hard work and caring for our seniors. Please refer your friends to apply for part-time and full-time job positions on Caregiverlist.com and visit our career center for additional career tools. We hope you have a great week. "A wise man changes his mind, a fool never will. " On this last weekend of the summer, we hope you are able to savor some time with family and friends. We invite you to take a moment to relax and enjoy our stress relief photo and inspirational quote and share them with loved ones. This week's photo was taken looking down on the beach in Myrtle Beach, South Carolina. Thank you caregivers and certified nursing aides for your hard work and the care you provide for our seniors. More caregivers are always needed as seniors in America are living longer. You can learn more about becoming a senior caregiver and apply for a job near you. We hope you have been enjoying the holiday weekend and have a great week. and should be undertaken with painstaking excellence." Caregivers provide companionship and caregiving to seniors, and must remember to "care for the caregiver." We thank you caregivers and certified nursing aides for your hard work and caring for our seniors. This week's stress relief photo was taken at a farmers market in Chicago, Illinois. The abundance of fresh fruit is one of the wonderful and healthy things about summer. We invite you to take a moment to enjoy the photo and the inspirational quote and share them with loved ones. We hope you have a great week, and an enjoyable Labor Day weekend with family and friends. We hope you are enjoying some of the long summer days. This week's stress relief photo was taken in Manchester, Connecticut. Caregiverlist invites you to enjoy the photo and share it with loved ones. At Caregiverlist we know the realities of caregiver stress. Thank you caregivers and certified nursing aides for your hard work and caring for our seniors. Please refer your friends to apply for part-time and full-time job positions on Caregiverlist.com and visit our career center for additional career tools. We hope you have a great week. "Wrinkles should merely indicate where smiles have been." We invite you to take a moment to relax and enjoy our stress relief photo and inspirational quote and share them with loved ones. This week's photo was taken looking down onto Rio de Janeiro, Brazil, just before the opening of the 2016 Olympic Games. It is that beautiful time of day when the afternoon gives way to the evening.Thank you caregivers and certified nursing aides for your hard work and the care you provide for our seniors. More caregivers are always needed as seniors in America are living longer. You can learn more about becoming a senior caregiver and apply for a job near you. We hope you have a great week. "You are not defeated when you lose. You are defeated when you quit." "Think of all the beauty still left around you and be happy." 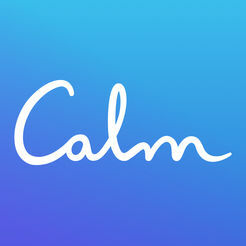 Calm is the #1 app for meditation. It is designed to help with relaxation and meditation. It has an array of features including meditation, guided breathing, help with sleep and relaxation scenes and techniques. Being a caregiver is very rewarding but it can also be extremely stressful. Make time to focus on yourself, this app can help! You can also follow our social media platforms to see our stress relief photo every week! Follow us on instagram, twitter and facebook! This week's stress relief photo was taken during the summertime in Iceland. Even in a country known for its icy and volcanic terrain, there are areas that are lush and green in the summer. Please enjoy and feel free to share the photo and inspirational quote with loved ones. Thank you caregivers and certified nursing aides for your hard work and caring for our seniors. Senior care training assists caregivers to better manage a senior's care needs and manage caregiver stress. We hope have a great week. "Beneath all old sayings lies the truth."